Finally it is Friday, and time for the weekend! Morning Ruby friends, it's Kim here today... and I have something special planned for this weekend :) Tomorrow I will be taking a drive to Kokstad to attend the wedding of my friend Ashley, and her fiance Struan. Her wedding is a little bit more special to me than normal because Filipa and I became a part of her planning process when we started designing her invitations. It is always amazing to do a wedding whose theme and colours you love, and this was no exception. We had SO much fun creating colour palettes and mood boards, as well as a few differently styled invitation designs for Ashley & Struan to browse through. Finally though, they settled on the design that we have photographed below. 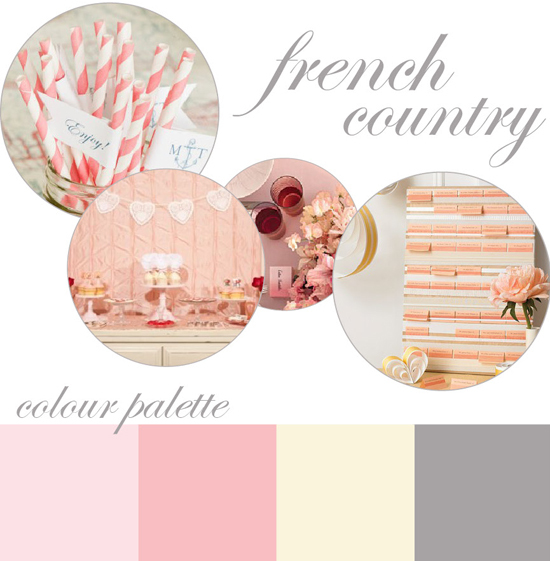 Colours of blush pink and dove grey, in a french pinstripe style, gave the invitations the "French Country" look they were going for. And the invitations came out beautifully, even if we do say so ourselves! Congratulations to Ash & Struan - you two are going to be so happy together! I can't wait for tomorrow, your Big Day. Mood board images from here, here, here and here.